Faced with the shutdown of the local sawmill, B.C. logger Ralph Stewart is blazing a new business trail these days, using B.C. government timber sales to keep his Valmet 941harvester processor, Valmet 890 forwarder and Caterpillar TK722 tilter feller buncher busy. The town of Radium in southeastern B.C. is thick with tourists almost year round because of its nearby hot springs, ski hills, national parks and close proximity to Calgary, where the oil industry still rules. It also used to be thick with logging trucks, but that was two years ago, before the Canfor sawmill shut down. The sawmill and millyard, clearly visible down the valley from the four-way stop at the north end of town, sits eerily silent. The town’s residents are hopeful, though, that with new senior management at Canfor and new lumber markets opening up—particularly in China—that the sawmill may reopen soon. B.C. logger Ralph Stewart’s Valmet harvester processor allows him to perform surgical extraction of trees on sensitive national park cutblocks. Ralph Stewart, co-owner of Ralph Stewart Contracting with his wife, Christine, was among the contractors let go after years of service to the company. However, he has managed to keep his Valmet 941 harvester processor equipped with a 370 Valmet head, Valmet 890 forwarder, Caterpillar TK722 tilter feller buncher and logging truck working. Based in Edgewater, just north of Radium, he is well known in the area given his 35 years of experience in the industry. He began his logging career back in 1976 for what was then the Revelstoke sawmill in Radium, which was later purchased by Slocan and then by Canfor. Over the years, he has also sold logs to Tembec and Louisiana-Pacific (LP). Tembec operates sawmills and a pulp mill south of Radium and LP has a laminated veneer lumber plant in Golden. Today, Stewart is much admired by his colleagues in the local forest community for his tenacity in holding on when so many other area logging contractors have closed up shop. He has successfully adapted to a new reality and is cutting a new trail to business success revolving around wood that becomes available through the B.C. government’s small business timber sales program. It requires a whole new approach to business management compared to the steady, daily diet of harvesting a company’s quota wood under a large logging contract. Stewart keeps his ear to the ground for forest blocks offered by the B.C. government in the area between the Rocky and Purcell Mountains as part of its plan to maintain healthy forests. He scouts them out and transports his equipment wherever he wins bids. Then he must find a buyer for the wood, which is usually done in advance of making a bid for the timber. Today he works in a variety of locations in the Columbia Valley from Golden to Kimberley and harvests just over 30,000 cubic metres of wood annually. He markets his pulp wood to Tembec, sawlogs to Woodex Industries, an independent sawmill located in Edgewater, and the posts to a company in Cranbrook. All told, he employs seven workers. He also employs other log truck contractors as needed. The wood basket in the area is almost exclusively softwood consisting of Douglas fir, lodgepole pine, spruce, larch and balsam fir. There are also small pockets of cedar. Log diameters average from 8” to 16”, but can come as large as 24”. There are as many as five sorts in each cutblock, requiring close coordination between the harvester processor operator and forwarder operator. Logs are sorted for diameter and species. The harvester processor operator will sort as best he can at the stump, with the forwarder operator making a more refined sort as he picks up logs and delivers them to roadside. Most of the wood is sawlogs. By employing a cut-to-length equipment approach, Ralph Stewart says he is able to economically forward logs over longer distances than a conventional logger can skid logs. The Valmet 890 forwarder in the fleet (above) also doubles as both a forwarder and as a log loader. 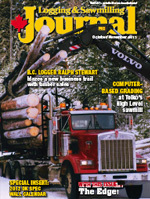 Stewart knows that his selection of cut-to-length (CTL) equipment instead of the more conventional feller buncher, skidder and roadside processing approach has closed a few doors to him over the years—but it has also opened others, such as the occasional selective logging contract that local national parks offer. 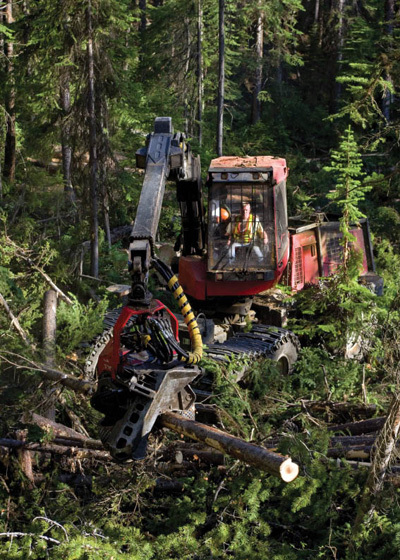 In addition to environmentally sensitive areas, Stewart can also access areas with softer ground conditions because of the superior flotation offered by his equipment fleet and can work at times of the year when loggers using conventional equipment are sitting idle. Stewart explains his initial reasons for adopting the CTL approach. “This approach gives you the ability to thin a stand without disturbing the ground very much,” he says. “At one time, we did a lot of thinning. We were doing 40 per cent removal in a lot of places.” He adds that with the CTL approach, he is able to forward logs over longer distances than a conventional logger can economically skid logs. Radium has three national parks in the surrounding area: Banff, Kootenay and Yoho. The parks conduct selective logging, which Stewart describes as “surgical extraction” to try to manage forest fire risk and also to remove hazardous trees located, for example, in campgrounds. The cutblocks themselves are typically quite small, in the range of 1500 cubic metres and are spread far and wide. “They (national park personnel) are very cautious on how the trees are removed,” says Stewart. “They set up test blocks to make sure that you can do the job that they want to have done.” Most of the wood harvested is lodgepole pine and Stewart helps the parks market the logs to local sawmills. The logging opportunity in area national parks is not all that common, but Stewart says it helps to keep him busy. The mountain pine beetle epidemic has undoubtedly introduced a new element into the local logging scene. It is the scourge of the B.C. Interior having already wiped out millions of hectares of merchantable timber. Despite sawmill closures due to market conditions as in the case of Radium, the B.C. government must still take action to try to manage the beetle epidemic. That has opened up both new logging and sales opportunities. “They’ll go into areas where the beetle is because, like Canfor, they are also trying to control it,” says Stewart. He adds that the beetle presence is creating a lot more off-grade logs. When he worked for Canfor, they were quite successful in flying the area, identifying active pockets of beetle infestation and sending him in to harvest the wood. 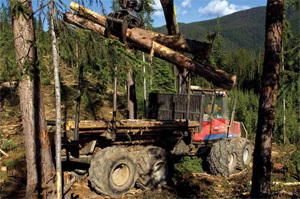 Today, the cutblocks offered by the B.C, government often include a beetle component that typically ends up as pulp wood, as well as a percentage of healthy timber to make it economical for loggers to harvest. Stewart has 15 years experience operating his fleet, so he is well versed in its capabilities. With the Caterpillar TK722 tilter feller buncher he purchased a year ago, he is also better equipped to harvest logs in this mountainous environment and will pursue logs up to 25 per cent slope in some instances. In that case, he has a Caterpillar D4 high track dozer to skid logs to more level ground for processing. While some may argue that CTL is less efficient than conventional logging, Stewart points out that he is able to log using few pieces of equipment. He doesn’t require either a skidder or a processor at roadside. Also, his forwarder doubles as a log loader. What’s rather unique is that Ralph Stewart Contracting has never really practiced conventional mechanized logging. Prior to the company purchasing its CTL equipment, it was hand falling, skidding to roadside with a Caterpillar skidder and then loading and transporting logs using a self-loading log truck. The company’s hand faller gladly became their harvester processor operator. “My hand faller was more than happy to get into a harvester where he had air conditioning in the summer and a warm cab in the winter,” says Stewart. As in most cases when adopting the CTL logging approach, it took him a while to learn how to operate the equipment efficiently to achieve daily production objectives. Despite the complexity of the equipment, Stewart does 99 per cent of the equipment maintenance himself. Downtime taken for maintenance these days is usually dictated by the volume of business available more than anything like spring break up. There are two co-generation plants in the area using biomass as feedstock—one at the LP LVL plant in Golden and one at Tembec’s pulp mill in Skookumchuck. Stewart feels the economics are still not quite there to justify a major investment into a grinder or chipper to supply that market, though.